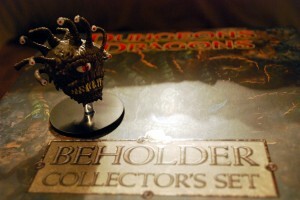 Beholder Collector’s Set: The Eyes Have It! It was either this, or “it really is in the eye of the beholder.” All terrible puns aside: I picked up the Beholder Collector’s Set. Clearly, I resisted the urge to purchase this set when it came out last November. But there it sat… at my friendly local gaming shop right next to Orcus. Beckoning me. What swayed my hand, you ask? Up until today, my collection of minis was distinctly lacking any Beholders. They are among my favorite classification of baddies, so I had to have them. So what do you get for your $35? Honestly, not much. There’s a nice collector’s box, the four beholders (painted quite well and rendered in varying styles of transparent plastic for ultimate coolness), and stat cards for use in the miniatures game. Is it worth it? I don’t know. As we have covered here, I have had a lukewarm relationship with miniatures in my D&D games. I don’t collect them, but I do enjoy using them in my games. In the past, I have struggled with the random nature of the miniature booster packs and balked at paying the going rate on Ebay for the desirable few. In fact, at GenCon I was fully prepared to purchase a Beholder at the miniature booth and was stopped short by a $20 price tag. 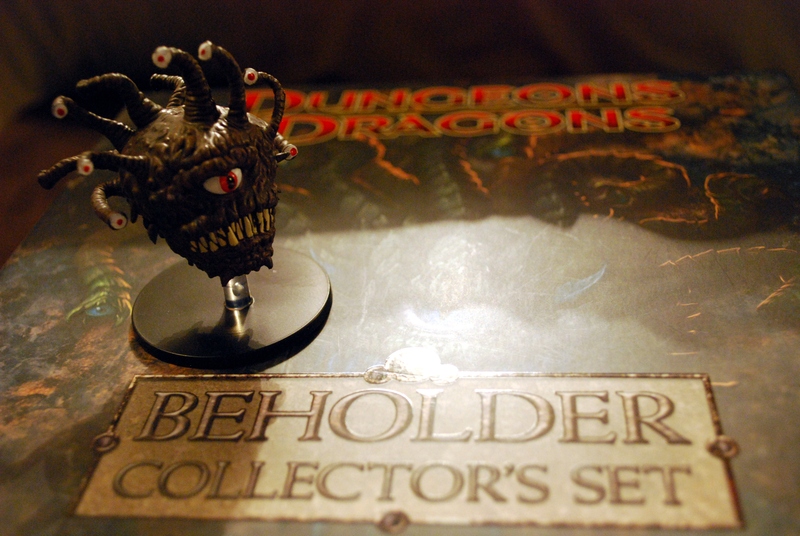 I suppose part of it is the Beholder Set being advertised as a “limited edition” although try as I might I found no edition number on the box or any of the figures. Which likely means “limited insofar that it is limited by how many we can sell to people.” I’ll happily retract that statement if someone can point me toward some way to determine how limited this run will be, but I view this approach as a convenient way to get people to ignore they’re paying extra for a fancy box and far less miniatures than you would get buying $35 worth of booster packs. Don’t misconstrue this as regret for my purchase. The set is very cool and I am happy to have them, I just would’ve been much happier with a cheaper price tag. No doubt my opinion will change dramatically when I get to roast my adventuring party with those lovely little eye-stalks, but that is a matter for another day. If you really like Beholders, you will not be disappointed by this set. If you really like to get a lot for your dollar, you might be disappointed. I think I’ll pass, as I’ve only ever used a Beholder once in the two decades of running games. Almost a TPK when I did, though.